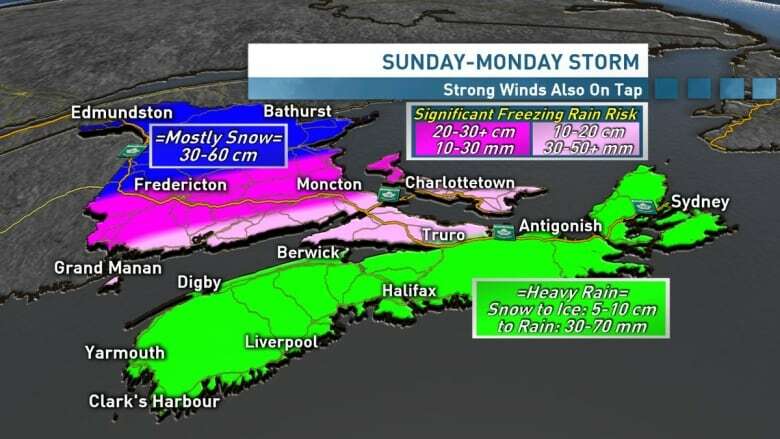 Snow, heavy rain and high winds hit the Maritime provinces Sunday, with winter storm warnings covering much of New Brunswick and part of P.E.I., and rain and wind warnings in Nova Scotia. 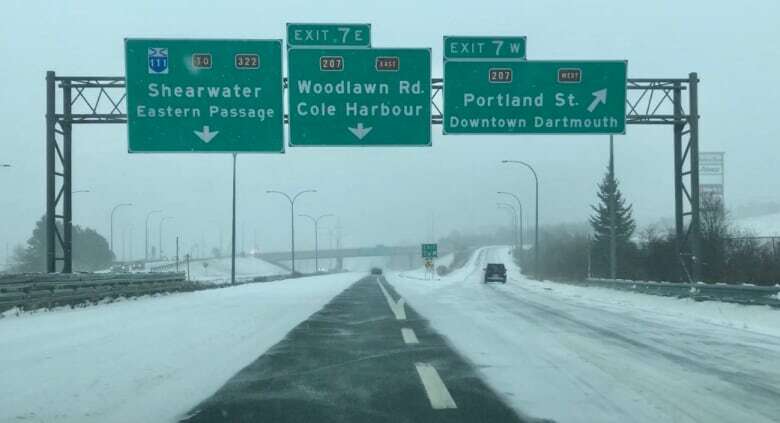 A winter storm hit the Maritimes with high winds, freezing rain, blowing snow and rain Sunday, with as much as 50 centimetres of snow in northern parts of New Brunswick. Environment Canada issued winter storm warnings for most of New Brunswick and western P.E.I. There were rain and wind warnings in effect across Nova Scotia. CBC meteorologist Tina Simpkin said warmer air Sunday afternoon will transform snow to ice pellets, freezing rain and rain in southern New Brunswick, the eastern half of P.E.I. and all of Nova Scotia. Temperatures are expected to hover around zero Sunday evening and fall again Monday, creating challenging driving conditions as precipitation hits still-frozen ground. STORM CENTRE | For the latest cancellations and closures in P.E.I. Simpkin said most of mainland Nova Scotia will see five to 10 centimetres of snow, mixed with some ice pellets, before 10 to 15 millimetres of rain later on Sunday. An additional 30 to 40 millimetres of rain is expected on the mainland tonight. In Cape Breton, the storm will arrive arrive later in the afternoon with heavy downpours resulting in about 25 millimetres of rain tonight, she said. As wind speeds picked up Sunday night, the number of power outages across Nova Scotia began to climb. By 8:30 p.m., about 14,900 Nova Scotia Power customers had lost electricity. The province's Emergency Management Office said it is monitoring conditions. RCMP in Nova Scotia is advising people on the roads to slow down. "Right now, there are some spots where one side of the road for instance is clear and wet, and the other side is frozen or still has some of the slush that's starting to freeze because colder temperatures are moving in," said RCMP spokesperson Sgt. Craig Smith. Between 30 and 50 centimetres of snow is forecast for northern parts of New Brunswick. People are advised to stay off the roads due to snow cover, drifting and poor visibility. Part of the Trans-Canada highway, Route 2, is closed westbound at the Quebec and New Brunswick border. The closure is expected to be in place for several hours. Southeastern parts of New Brunswick and P.E.I. will also see five to 20 centimetres of snow and ice pellets before it changes to freezing rain, then up to 20 millimetres of rain. Fredericton and northern New Brunswick will see more snow, but some freezing rain is also expected in the Fredericton area this evening. Simpkin said a band of freezing rain could extend to Moncton and the Miramichi. "There could be prolonged periods of freezing rain that will persist, a little of freezing rain is never a good thing," she said. "It's going to be slippery." CBC PEI's meteorologist Jay Scotland said the Island would see a mix of precipitation with snow changing to freezing rain and then between 20 and 40 millimetres of rain possible. Since the ground is frozen, the rain may pool on the roads, said Scotland. "With temperatures soaring this evening that will lead to snow melting, that rain falling, localized flooding and flooded basements will be the big concern tonight," he said. High winds will peak tonight with gusts up to 90 to 100 km/h in parts of the Maritimes. Environment Canada is warning the high winds could damage buildings and snap tree branches. It said tides are also very high this weekend, which could lead to elevated water levels and pounding surf along the Atlantic Coast. 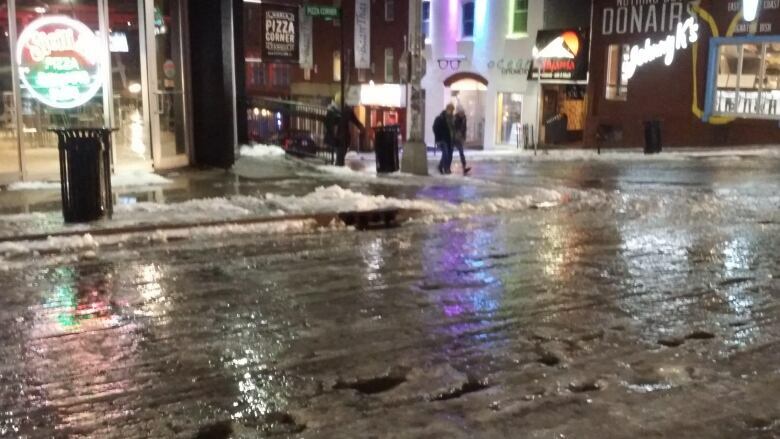 Localized and flash flooding could create treacherous driving conditions, according to the weather service. Power outages are also possible, with the combination of the heavy snow, the risk of freezing rain and strong winds, Scotland said. Temperatures will drop again Monday, creating icy patches on the roads as things freeze again, he said. That cold spell will ensure things are frozen by Monday evening. There have been dozens of delayed or cancelled flights at airports across the Maritimes. People are advised to check with their airlines. Marine Atlantic sailed earlier than usual this morning between North Sydney, N.S., and Port Aux Basques, N.L., to try to keep ahead of the messy weather. Bay Ferries cancelled its crossings in the Bay of Fundy. The La Have ferry service in Nova Scotia has been suspended. The Halifax Regional Municipality's overnight parking ban will be in effect starting at 1 a.m. on Monday.